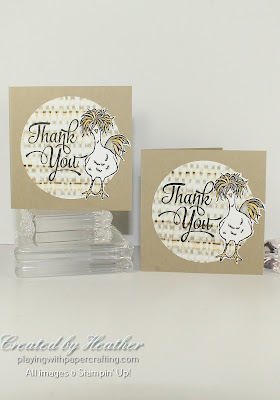 Playing with Papercrafting: Thank You Chick! 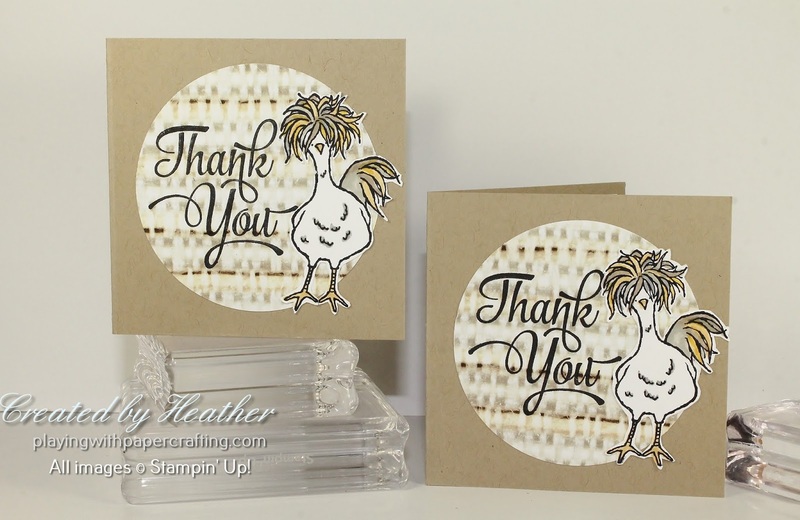 Are you tired of "Hey Chick", the crazy chicken stamp set from Sale-A-Bration, yet? No? Me, either! And even if you are, it's my birthday today, so I get to do what I want, right? 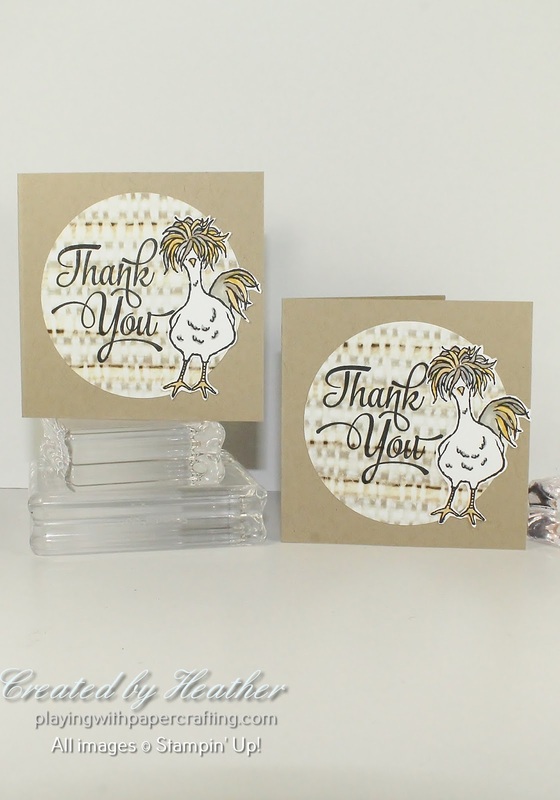 So you get another dose of Hey Chick! 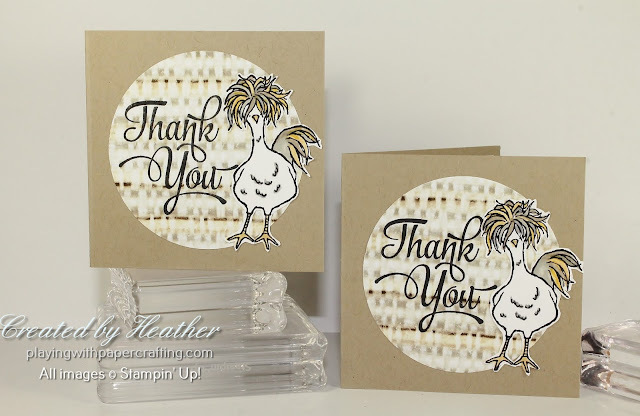 These are customer thank you cards and they were pretty quick and easy to make if you don't count fussy cutting the crazy chicken. The 3" x 3" card base is Crumb Cake cardstock, with a circle die cut from one of the Serene Scenery designs with a Layering Circles die. The sentiment is from one of my most used stamp sets called One Big Meaning and it's stamped in Basic Black Archival Ink. 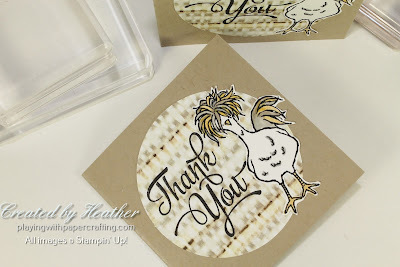 The chicken from the Hey Chick stamp set is also stamped in Basic Black Archival ink and then coloured in using a variety of Stampin' Write markers including So Saffron, Crumb Cake, Safari Sand, and Smoky Slate, maybe even some Daffodil Delight thrown in there. Just getting back today from visiting my grandsons and my daughter Jaimie and hubby, Pat, where we celebrated Parker's and Jackson's and my birthday! Lots of fun was had by all!